Do high end specs automatically make a good Android phone? 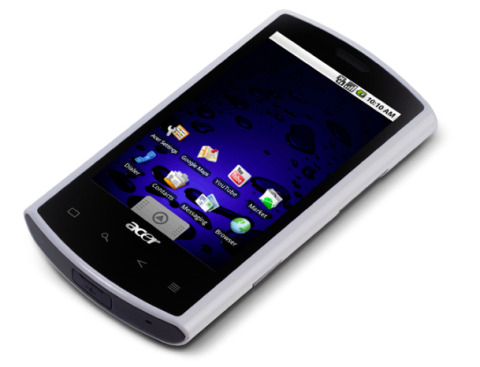 By bringing the fastest Android phone on the planet to market, Acer has good reason to be proud of the Liquid S100. Packing a Qualcomm Snapdragon processor and super hi-res screen, there's a lot to get excited about on this phone. Acer might be a relative unknown in the mobile world, but that hasn't stopped it making an impression with first the Windows Mobile NeoTouch S200, and by bringing top-end specs and the Android OS, the Liquid S100 will be seen by some as even better. But one constant problem with Acer phones from the past is that despite bringing some nice parts, they often fail to be anything more than average in general use. So can the Liquid change that? The phone looks pretty basic out of the box, with a white plastic shell encasing a 3.5-inch screen, but with the large amount of plastic border around the display, it doesn't look anywhere near as big as the iPhone or Samsung H1. The four touch-sensitive buttons at the bottom offer basic Android navigation, and the hieroglyph look is pretty neat. The left of the phone houses the power/lock button, and the right has the volume and shutter buttons. Pressing the former is pretty easy one handed, but the chassis creaks a little from time to time. Weirdly, Acer has decided to go for a miniUSB slot on the Liquid, which seems a little old fashioned. The slot is located on the bottom of the phone, and when charging, a little white battery indicator appears on the top of the chassis, next to the 3.5mm headphone jack, which was a neat touch. The phone has a single speaker on the back, next to the camera, which is adequate but pumps out basic 'chav on a train' sound quality. Pulling the battery cover off is a worrying experience – it seems digging your fingernails in at the top and pulling rather hard is the way to do it, and it feels very much like you're going to snap something off. Overall, the feel of the phone is a little cheap – the plastic of the white chassis and silver buttons makes it feel a little toy-like. Acer offers a simple range of accessories in the box – a miniUSB connection lead and separate charger are a nice touch, and the bundled ear phones are decent enough, doubling as a hands-free kit too (although without media control). We're still yet to learn how to use screen protectors on a mobile yet without adding a million bubbles to the screen, but you get a few of these in the box too. There's also a 2GB microSD card, as well as an adaptor to turn it into a full SD card too. This is pivotal, as the phone won't save any media or photos to the 512MB inbuilt memory for some reason.